Сегодня сосредоточимся на отработке глагола to bе и выполним несколько интересных упражнений. Но вначале предлагаю вспомнить правила употребления глагола to be. Вспомнили? Отлично! Переходим к упражнениям. Все упражнения на глагол to be даются с ответами, поэтому не забывайте проверить свои знания! Глагол to be в Present Simple. Am / is /are exercises. Упражнение 1. Fill in the gaps as in the example. 2. He is from Spain. 3. You are a singer. 4. It is a picture. B We are not students. Упражнение 2. Complete what Brenda says about herself on the picture. Use am, is or are. My name (1) ______ Brenda Foster. I (2) ______ on the left in the picture. I (3) ______ ten years old and I (4) ______ in the fifth form. My birthday (5) _____ on the first of January. I (6) ______ from Santa Monica, California, USA. I (7) ______ American. My phone number (8) ______ 235-456-789. I live at 16 Park Street. My post code (9) ______ LA 30 SM. I’ve got a sister and a brother. Their names (10) ______ Gina and Paul. Gina (11) ______ 16 years old and Paul (12) ______ only three. I’ve also got a dog. His name (13) ______ Spot. He (14) ______ on the right in the picture. My Mum (15) ______ a doctor. She works at a hospital. My Dad (16) ______ a driver. He works in Los Angeles. We (17) ______ all friendly in our family. Упражнение 3. The verb to be. Insert appropriate present forms. Упражнение 4. Write in is / isn’t, are / aren’t, am / ’m not. Упражнение 5. Fill in is, are, He’s, She’s, l’m, They’re. How _____ your mum? — _______ fine, thanks. How _____ your parents? — _____ OK.
How _____ you? — _____ very well, thank you. How _____ your uncle? — _____ fine, thanks. How _____ your children? — _____ OK.
How _____ Liz? — _____ fine, thanks. Упражнение 6. Write in am /’m not, is / isn’t or are / aren’t. My mum _____ a shop-assistant. 1. How much ________ the trousers? 2. How much ________ these shorts? 3. How much ________ a pair of socks? 4. How much ________ this scarf? 5. How much ________ this dress? 6. How much ________ the jeans? How much _______ the shoes? How much _______ the jacket? Глагол to be в Past Simple. Was / were exercises. _________ Jenny at the party? _________ your parents in the local gym yesterday? _________ your friend at school yesterday? _______ your mum tired yesterday? _______ you hungry yesterday evening? _______ your teacher sad yesterday? _______ your pet hungry yesterday? The third day _______ Wednesday. The boys _______ in the swimming-pool. Steve _______ the fastest swimmer! On Thursday we _______ at the circus! The bears _______ funny! The fifth day _______ Friday. In the morning we _______ in the zoo. Комплексные упражнения на отработку to be. «____ you English? «No, l _________. «______ David a good friend?» «Yes, he _______». «You_______ from Belarus, _________ you?» «Yes, that______right». There__________ a nice lake in the forest. Let’s go! There ________no more questions, _________there? They (not) ________ ready for the lesson last Tuesday. The days_________ cold and wet last September. There ________20 pupils in our class last year. 13. I ________ill for the last few weeks. 14. Where _______ John _________ all day? 15. They (not) ________ to this part of the country. 17. He ________ 13 years old tomorrow. 18. I ________ back home at 6 o’clock. 19. We __________ at the library at that time. 20. They __________ here at 3 o’clock. 21. They ________ happy to see us. Hello! Му name ________ Alan. I________ thirteen. My friend’s name ________ David. He ________ thirteen, too. We ________ from Belarus. Last summer we ________ at the seaside. The weather ________ sunny. There________ many people on the beach. We had a good time. I hope next summer it ________ sunny and warm, too. There________ a lot of nice days. I ______ never ________ to other countries. Some day in future I ________ lucky to visit London and my holidays ________ great. 1. The animals ________ in danger. 2. There ________ only a few mountain gorillas in the world now. 3. It ________ the thirty-first today. 4. The wind ________ strong yesterday. 5. We________ at the end of Cliff Road when Alan fell down. 6. What ________ the weather like yesterday? 7. I hope your leg________ better soon. 8. ________ you________ at home tomorrow? 9. _______ you ever________ to London? 10. I ________ ill for a week. 1 is / she’s, 2 are / they’re, 3 are / I’m, 4 is / he’s, 5 are / they’re, 6 is / she’s, 7 is / she’s или he’s. Past Simple: правила образования и случаи употребления. 16 Комментариев для "Упражнения на отработку глагола to be. 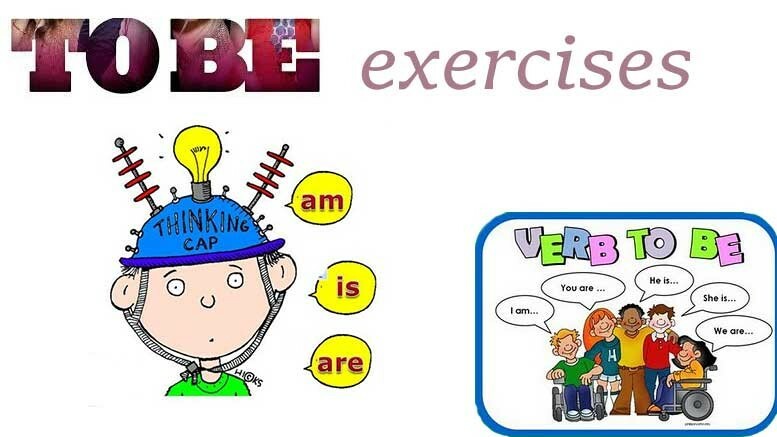 Exercises verb to be"
В упражнении 2 в задании написано «Use is or are», а нужно написать «Use am, is or are». а почему во 2 задании.к собаке используется местоимение he, а не it? Лина, скорее всего, предложение взято из сказки. Не обязательно из сказки. В английском говорят «she» и «he» по отношению к животным, в том случае, если это домашний любимец или же иные животные, к которым есть персональное отношения (например, по отношению к лошади). Неплохо, для тренировки грамматики и запоминания самое то. Тоже самое бы, только с применением более широкого словарного запаса. Подскажите, разве артикль THE употребляют с существительными во множественном числе? Упражнение 11. The bears _______ funny! Конечно, артикль THE употребляют с существительными во множественном числе. Как-то сразу доверие к вашему сайту пропало( — Да что вы? ну почитайте другой.